The Specialty Graphic Imaging Association (SGIA) is the epitome of what it means to be innovative, so it was no surprise that in 2018 the association launched an equally inventive conference. 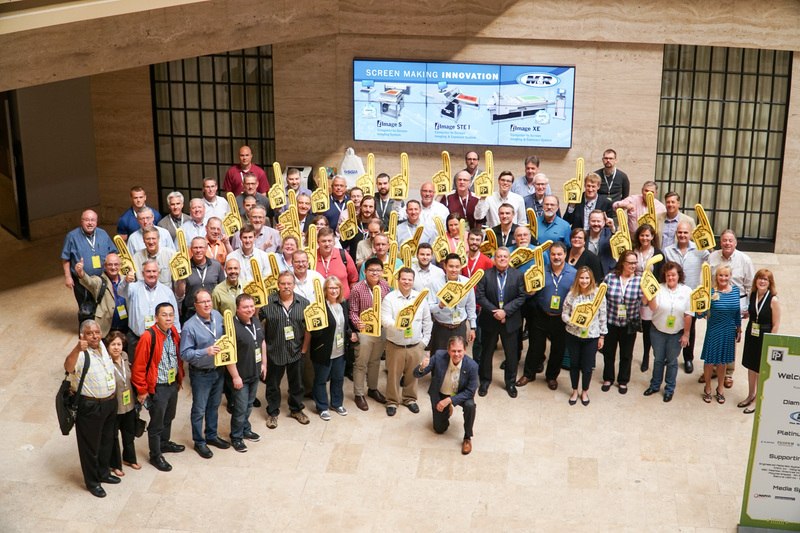 The inaugural FP3: Functional Printing, Process and Products Conference, explored new technologies and concepts over a three-day period, June 4-6, 2018, in Itasca, Ill., through educational sessions, a sponsor showcase and social events. 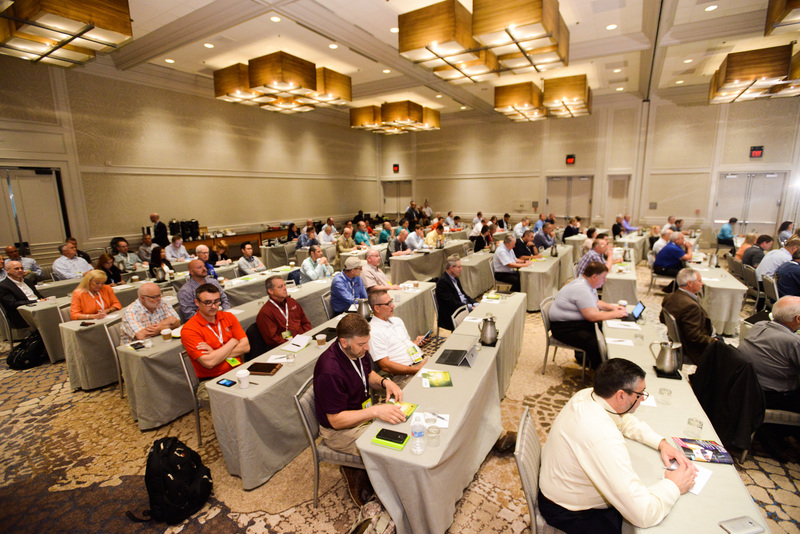 The conference, designed by SGIA’s Industrial Applications and Printed Electronics Committee and attended by 135 industrial printing professionals at the Westin Chicago Northwest, consisted of three focus tracks — printed electronics, business topics and industrial topics. “FP3 was a very informative conference as well as an atmosphere that allowed more openness to networking. The conference not only covered trends in the functional printing industry but also trends on how to hire, retain and create good teams for your workplace. It also covered new marketing trends and how to establish them,” said attendee Aaron Maldonado, a technician at The Boeing Company. On Monday evening, June 4, 2018, FP3 officially kicked off with a welcome reception where attendees were able to check out the sponsor showcase for the first time and get a sneak peek at what exciting new technologies are in this growing market, meet new faces and catch up with old friends. 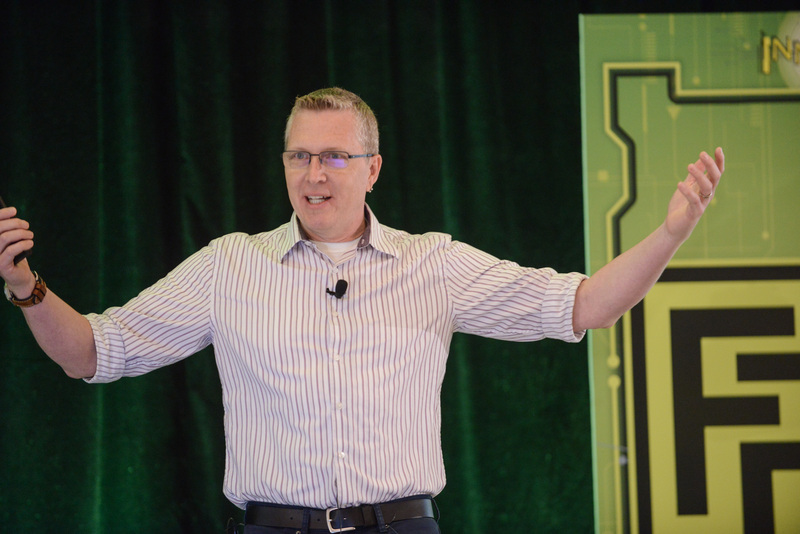 David M. Hogue, Ph.D. is a UX design leader, product strategist, and applied psychologist with 20+ years experience. Tuesday began with David Hogue, UX Design Lead at Google. He opened the morning with an inspirational and keynote presentation on how humans perceive, understand and behave in the world. Hogue is a UX design leader, product strategist and applied psychologist who uses design, research and psychology to deepen insight into user behavior, guide product strategy and service design systems and solve challenging UX problems. He’s currently with Google, working on the Android ecosystem. During the presentation “Psychology & Design: Better UX, Better Products,” Hogue dove into how the UX (user experience) and how understanding the magic (rather, he says, isn’t magic) behind how people think will help us create better products and services based on psychological principles and theories. Designing a product must go beyond the physical interface design and into the deeper levels of the experience such as context, goals and culture. Hogue pointed to relevant examples in social media with our human need to be liked and acknowledged and even used “Where’s Waldo” to point our focus of attention in printed items such as a restaurant menu or coupons. Color choices, even font choices can drastically change one’s perception. While Houge touched on the psychological principles behind product design, Michael Burrows of DuPont and Mike Wagner of Butler Technologies, Inc. dove into a real-world example of how all of this comes together to create something tangible. 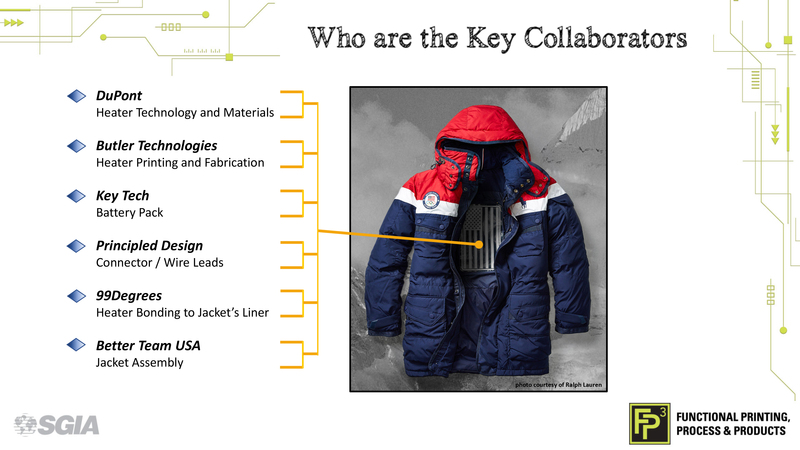 In the featured general session, “Collaboration Leads to Innovation – The Story of the Ralph Lauren Heated Olympic Jacket,” Burrows and Wagner highlighted the massive technological feats conquered through designing and curating the heated parka and focused on best practices for collaborating on a project. For the 2018 Winter Olympics, Ralph Lauren was tasked with creating the American Olympic team’s opening and closing ceremony uniforms for use in South Korea’s cold winter. Temps on average during this time of year hover around 15 degrees Fahrenheit. As part of the uniform, Ralph Lauren — along with many invested partners — designed and created a parka and bomber jacket that used heat-conducting ink to generate warmth. Both DuPont and Butler Technologies collaborated on the project for the heater technology and heater printing and fabrication, along with Key Tech for the battery pack, Principled Designs for the connector and wire leads, 99Degrees for the heater bonding to the jacket’s liner and Better Team USA for the jacket assembly. In this day and age, there are very few companies with enough resources and technology to produce every aspect of such innovative products, so partners are paramount. Burrows and Wagner shared with attendees that it is important to have pre-existing relationships between innovators in order to speed up the development process. This allows a certain level of trust to develop over time, lets each other know their processes, as well as strengths and weaknesses. Some other bits of advice they shared: Have the financials and agreements in place, this irons out any paperwork delays getting in the way of the project timeline; and break down the project into smaller, more manageable projects. Some ways to set yourself up and network with potential future partners include attending conferences and expos, getting involved in collaboration groups, becoming members of local and regional development organizations and meeting people in your field and related fields. “Collaborate with your suppliers and customers — you already have these relationships — this is low-hanging fruit,” Burrows stated. One of the biggest challenges in the printing industry is finding and hiring good talent. One of the afternoon presentations was presented by ECI Screen Print’s Ed Cook and focused on his company’s discovery of an untouched market: career opportunities for artists within the printing industry. Artists are a great resource to have in the printing industry. Cook says they think like entrepreneurs, have tremendous capacity to envision a product or solution and approach everything from a very passionate point of view. To recruit these specialized workforce workers, Cook suggests search for university art degree programs, network with professors, invite students to open houses and plant tours, visit school shows and create internships. From medical to the fashion industry, functional printing is everywhere. Electronic devices are in our pockets, our handbags and in our bodies. As more compelling use-cases emerge, they are slowly making their way into our clothing. There are many ways to integrate electronic technology into textiles and apparel, printed electronics being one of the most promising, versatile and elegant techniques. Wednesday morning Meg Grant from Seismic presented “Printed Electronics for Function and Fashion” and pointed out the many design requirements that are faced when working on producing powered clothing and e-textiles. Not only does one need to be concerned with the actual apparel or design, but the mechanical and electrical components need to be considered along every step in the process. To round out an informative and fun three days, on the afternoon of June 6, attendees took a tour of The M&R Companies facility in Roselle, Ill.
FP3 was supported by 18 sponsors: The M&R Companies (Diamond Sponsor), Elantas, Fujifilm, Memcon, Norcote International, Proell Inc. (Platinum Sponsors), Engineered Materials Systems Inc., Fimor North America, Kiwo Inc., Natgraph Ltd., Nazdar, NBC Meshtec Americas Inc., Nicomatic North America, Polymershapes, RH Solutions LLC, SAATI, Sakurai USA Inc. and Schilling Graphics (Supporting Sponsors). “Many attend conferences and symposiums in an effort to enhance existing revenue streams. The FP3 conference certainly provided value from that perspective. However, the return on my investment from this conference was the knowledge that I gained by better understanding innovative industrial technologies that I was not aware of. That’s learning!” says attendee Chris Eckhart, president, Eckhart & Co. Inc. Riding on the success of the first ever FP3 Conference, SGIA is already planning the 2019 installment. The location and dates will be announced soon. To receive updates on next year’s conference be sure sign up here: https://info.sgia.org/fp3-2019.